What later became the THUNDERSTONE you know today, started as a side project by ex-speed/thrash group Antidote’s guitarist Nino Laurenne in early 2000. After handling the vocal duties himself on the very first demo, Laurenne then recruited former Antidote bandmate Titus Hjelm on bass and backing vocals, Pasi Rantanen on vocals, and Mirka Rantanen on drums. By the summer of 2001, Kari Tornack joined the ranks as keyboardist, and THUNDERSTONE evolved into a quintet. 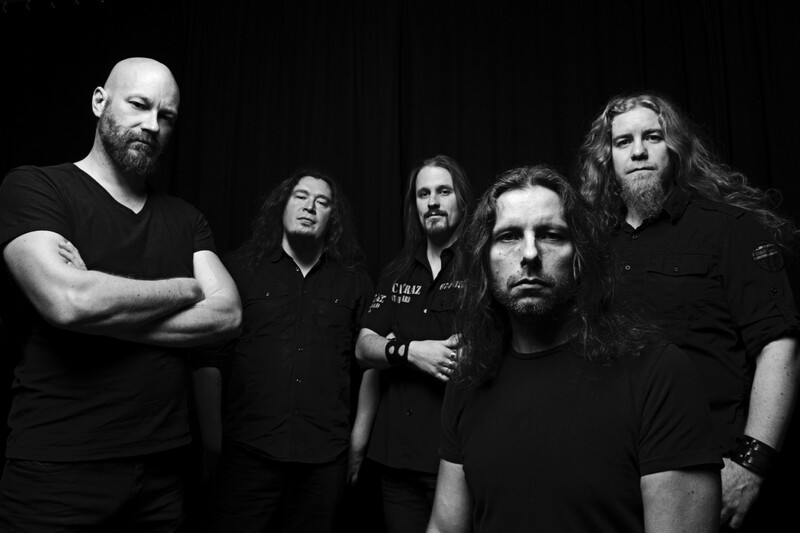 With a demo in circulation garnishing positive praise and the new line-up concentrating on writing new music, things came to the inevitable head in the Fall of 2001: Nuclear Blast’s attention was captured, a record deal was secured, and THUNDERSTONE rushed into the studio within two weeks of the ink drying. When THUNDERSTONE’s self-titled debut hit worldwide audiences in 2002, the buzz proved to be loud. Recorded at Laurenne’s own Sonic Pump Studios in Helsinki, Finland (with Laurenne as guitarist, producer, and engineer) and mixed by Mikko Karmila (e.g. Children Of Bodom, Amorphis) at Helsinki’s famous Finnvox Studios, the album was received with enthusiasm across the globe. Featuring accomplished compositions, a guest appearance by Timo Tolkki (a friend of Laurenne’s for over a decade, who gave him his first-and-only guitar lesson) on “Like Father, Like Son,” and artwork by well-known German visual artist Thomas Ewerhard (e.g. Hypocrisy, Sodom, Destruction), the band ended the year with a strong presence on numerous year-end “Top Metal Albums Of 2002” lists. In 2003, after being named “Newcomer of the Year” by the readers of Germany’s Rock Hard Magazine, THUNDERSTONE celebrated their accomplishments with an extensive European tour supporting Stratovarius and Symphony X.
THUNDERSTONE returned to Sonic Pump to record their sophomore album, The Burning, which featured Symphony X guitarist Michael Romeo on “Drawn To The Flame.” The album not only exhibited the band’s matured collective personality through faultless production, but captured a grittier and more uninhibited performance by vocalist Pasi Rantanen. Among many other accolades (such as the appearance of their promotional video for “Until We Touch The Burning Sun” on Finnish television), the album celebrated a rise to #13 on the official Finnish album chart. While their European tour with Iced Earth was cancelled due to Jon Schaffer’s back injury, THUNDERSTONE were determined to maintain their momentum and quickly booked another tour with Axel Rudi Pell, crowning another successful year by playing for thousands of fans at the world’s most well-known metal festival, Germany’s Wacken Open Air. Despite a busy year the band entered the studio again in late 2004. The efforts of those sessions showcased the band at a new pinnacle. Tools Of Destruction (2005) – the band’s third album recorded at Sonic Pump – is where you’ll also hear THUNDERSTONE’s accumulated live experience. One listen to the album’s opening track, the breathtaking curtain-raiser “Tool Of The Devil,” and the chorus’ gargantuan hook will capture you as it did THUNDERSTONE’s fellow Finns, who sent the song straight to #3 on the Finnish Singles Chart. Gigs in Finland and the first headlining European tour with label mates Crystal Ball followed. After a short breather, the band returned yet again to the studio to record their fourth album in the fall of 2006. The same year also witnessed THUNDERSTONE’s first appearance in the USA. In October the band was invited to take part in the Finnish Eurovision Song Contest. Never shy to take on a new challenge they heartily agreed. Again, what started almost as a joke ended up in phenomenal success: The band came second with tens of thousands of votes. The Eurovision fame resulted in the release of two singles, 10 000 Ways and Forevermore/Face in the Mirror, which both went straight to the top 3 in the Finnish single charts. Finally, the efforts of the previous studio sessions came to fruition when THUNDERSTONE’s fourth studio album Evolution 4.0 was released in March 2007. Showing a darker side of the band and definitely moving them away from the “power metal” of their first release, the album was liked by the fans and entered the Finnish charts at #10. Again, a Finnish tour and summer festivals followed. Already preparing for a co-headlining European tour with Swedish colleagues Nocturnal Rites, the band announced a shocking surprise in August 2007: THUNDERSTONE had parted ways with singer Pasi Rantanen and keyboardist Kari Tornack. Musical differences and motivation problems were quoted as the main reasons for the unexpected split. Despite the difficult situation, the rest of the band decided not to disappoint their fans and do the planned European tour. The band recruited vocalist Tommi “Tuple” Salmela from Finnish classic heave metal outfit Tarot—Marco Hietala’s original band—and keyboardist Jukka Karinen and kicked arse all around the continent. The temporary line-up created a flood of speculation, which came to an end with the announcement of the new line-up in early February 2008. The vocal duties were taken up by Rick Altzi, the Swedish powerhouse known for his for with At Vance. On the keyboards the band signed Jukka Karinen, who already handled the key duties on the 2007 European tour. In the summer of 2009 the now multinational THUNDERSTONE retired to a cabin in the Finnish woods to write new material. These sessions resulted in the 2009/2010 release of Dirt Metal, the band’s fifth studio album and the first with new labels Sony Music and SPV records. Gigs and festivals followed. In 2010 the band visited Russia for the second time, playing to full audiences, but with a replacement drummer for Mirka Rantanen, who parted ways with the band earlier that year. After these gigs fatigue set in, and THUNDERSTONE went on an unannounced hiatus. A chance encounter between Nino and Pasi in 2012 led to a rapprochement between THUNDERSTONE’s original voice and the rest of the band. Another cottage-in-the-woods session followed (this time with a drum machine), and the spark was reignited. With a couple of new songs under their belt, the band started looking for a new drummer. An international audition call garnered over 30 YouTube submissions from around the world: Finland, Sweden, the Netherlands, France, Germany, Italy, UK, Israel, USA, Chile, and Argentina among others. After inviting three of the contestants for a demo session at Sonic Pump Studios, the band announced the recruitment of Atte Palokangas in late 2013. Brewing plans for the next album, the next cottage-in-the-woods session—this time with Atte on drums—took place in the summer of 2013, resulting in most of the material for the upcoming album. With a new line up and killer songs under the belt, THUNDERSTONE flexed its live muscles for the first time in more than four years in 2015. Impressed by the energy and hunger of the live performance, Finland’s premier metal label Sakara Records signed the band in 2015. Now busily working on the new album, the band also joined forces with AFM records in Europe and Marquee Records in Japan for worldwide distribution. The fruit of several years’ careful work, Apocalypse Again, THUNDERSTONE’s sixth studio album set to be released April 1 2016, is a return to form with original vocalist Pasi Rantanen and new drummer Atte Palokangas. Comprised of nine tracks that range from catchy sing-alongs to fast double bass drum assaults and Hammond-driven hitters, Apocalypse Again leaves no-one cold. It is a fitting summary and a testament to the past, present, and future of THUNDERSTONE: Classic Heavy Metal at its best!